For the fourth consecutive year, the Spaniard will have a tier in the GP of Spain. The weekend pack costs 99 euros instead of 340. For the fourth consecutive year, there will be a Carlos Sainz grandstand at the circuit of Montmeló during the next GP of Spain (May 10 to 12, 2019). The Madrilenian presented the edition of this season at the Railway Museum of Madrid, with the suitcase ready to travel to Melbourne, along with the director of strategic marketing of Estrella Galicia, José Cabanas. On the stand, which will occupy the Tribuna M Circuit de Barcelona-Catalunya, will have a capacity of 3,500 people and the pack will include entry for the entire weekend, hat, flag and beer cans for 99 euros (the usual price in that sector is 340 euros) . 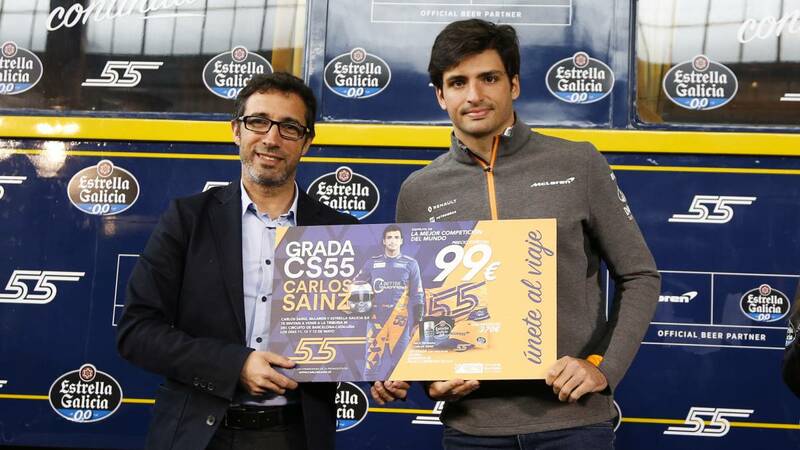 "F1 has that elitist touch with ticket prices that not everyone can reach, but thanks to the Circuit, Estrella Galicia and McLaren we have been able to put together this package, just like the last year, with a very competitive price compared to the rest of the grand prix tickets, "says Sainz, who as usual will go through the stands to sign autographs and take photos on Saturday, after qualifying. Tickets went on sale this Wednesday through its website and the Madrid says: "Last year sold out in a week so I recommend people to be attentive."